To assign or not assign, that is the question that we are tackling in today’s blog post. 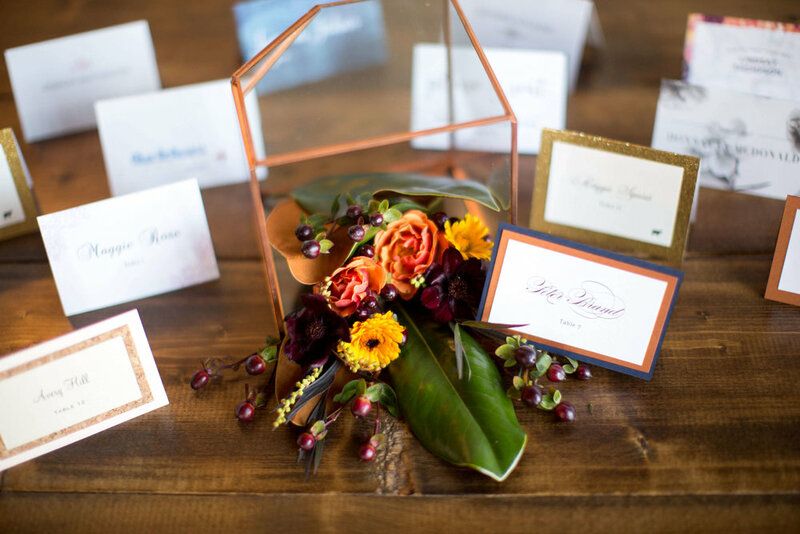 Many couples, understandably, shudder at the idea of having to decide where their guests will sit and by whom, however table assignments are incredibly important. Not convinced? Here are a few wedding table assignment myths, debunked. Guests will appreciate you putting thought into where they should sit, but they will also appreciate having one less decision to make for your wedding. Picking where to sit can yield a bit of social anxiety for some people, they don’t want to sit in the wrong place, or far away from people they like or even at a table with no one else that they know. Remember in grade school, when you thought you hated your ‘assigned seating’ but then you got to college and even with the freedom to sit anywhere you wanted - you still sat in the same spot all semester? And don’t be worried that guests will feel stuck to hang out with the people at their table, guests will mingle and mix as they see fit, especially if you’ve hired an amazing DJ - they’ll likely spend most of their time post-dinner on the dance floor! I’m not saying you have to assign guests to seats at tables (which is a lot of work), just pick a group of 8 or 10 (depending on the table size) people, whom you think will get along and give them a table number. Simple! Keep reading for how to make it even easier. Wimping out and just setting a ‘reserved’ sign on the head table and two family tables won’t quite get you to where you want to go. How will guests know if they are a VIP or not? WHAT ABOUT GUESTS WHO DON’T RSVP? HOW DO I SAVE THEM A SEAT? Inevitably you will have tables where you just can’t find that last person to fill that last chair, so you might assign guests to tables that aren’t at full capacity. For example, if your wedding venue comes with 72” round tables, which can seat 10-12 guests per table, and you have a guest list of 145 (excluding the head table) then you are looking at 14 or 15 tables. Scenario one: you could have 9 tables with 10 guests each and 5 tables with 11 guests each. Scenario two: you could have 13 tables with 10 guests each, 1 table with 7 guest and 1 table with 8 guests. See how in scenario two there is ample space to add someone to a table, someone who rudely didn’t RSVP but thought it appropriate to still show up. CAN THE HEAD TABLE BE NUMBER ONE? You can number your tables how ever your heart desires. Make it easier on your guests and number tables in some sort of order. This makes it easier (and quicker) for guests to find their table, but also makes it easier for your servers to serve tables. I know that you are tackling this project right at the end of your planning process, and you might be feeling low on wedding task motivation, however power through and stop leaving this task on your to do list. I recommend using Aisle Planner… duh. Under the LAYOUT tab add tables and chairs to tables, drag and drop guests on the right hand column to tables, it’s easy and intuitive. Start with family tables (Aisle Planner sorts it for you, as long as you’ve sorted it in the GUESTS tab) and add people until the table is full. Don’t overthink this part! If you have parties of 6 or 7 try splitting them in half and seating them with the guests that you feel like don’t have a ‘spot’. Alter numbers to your table groupings based on your layout - family tables should be seated closer to your head table, friends tables should be seated on the dance floor if you plan on clearing tables for the dance. Pick a pretty template in Canva, or hire a designer; copy, paste and print! Don’t forget your head table! For this you are likely assigning your pals to seats at the tables, you’ll want to create a layout, including the orientation (like which way is the table in the room) and label each chair. Okay, so it might not be quick and it might not feel easy or simple, but using Aisle Planner definitely takes a lot of the stress out of ensuring all guests are accounted for in your seating chart. And Canva has a lot of pretty templates to print out one large seating chart (sorted alphabetically) or print place cards. Of course, the best play would be to hire a calligrapher or designer to hand craft your place cards, and then hire me to be there on the day of to set up your place card table (among other things)! Need More tips on guest seating?